I know it seems romantic, a lock signifying your everlasting love fastened forever to a bridge in the City of Light—and sure, a few years ago it was quite a novel and charming idea. But now, dear tourists, much like the Real Housewives series, it’s just too much of a good thing. The delicate Pont des Arts has become a freakish glut of indistinguishable metal lumps, and worse, is now in mortal danger. Poor, lovely bridge. And what about all those keys you’re tossing into the Seine? Did you think about that, my tourist lovebirds? That can’t be good for the health of the river. But what do you care? It’s not like you live here; it’s just a photo op to you. 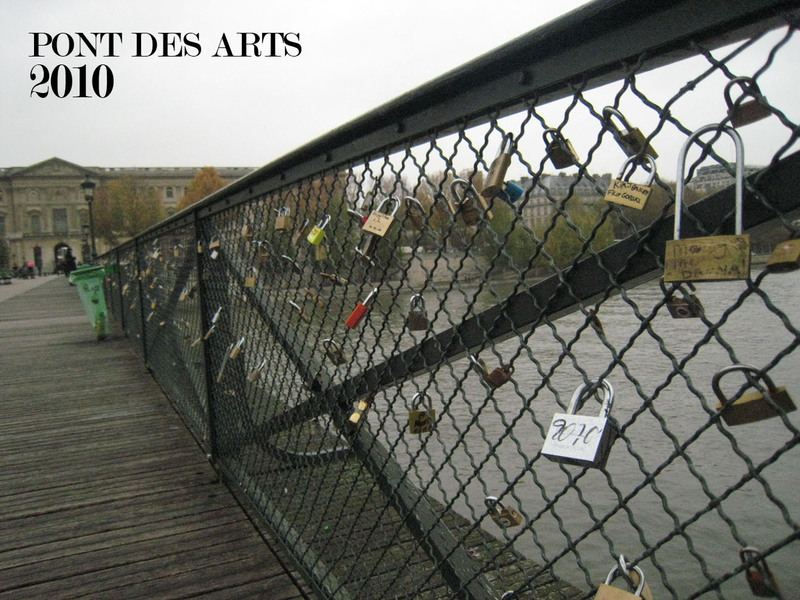 The Pont des Arts, the early days in 2010. It looked innocent enough. But now, my romantic tourist types, as if the Pont des Arts wasn’t enough of an outlet for your mania, you’ve descended upon the sweet, unassuming Pont de l’Archevêché, which is so densely encrusted with your love locks—locks on top of locks, locks fastened to other locks, huge bicycle locks (really? )—that you practically have to walk sideways to cross the bridge. It’s madness I tells ya, sheer madness. The mania takes hold on the Pont de l’Archevêché. Is there no end to the madness? I get it, my tourist friends, you read all about this tradition on that there interweb and you want to be able to say you did it, too. But you know, it is okay to have an original idea all your own. When you can clearly see there is not one centimeter of space to hang your lock, maybe it’s a sign this idea is played out. Been done to death. Like, so four years ago. It’s not that we don’t embrace your love; we love that you love. But perhaps, you could find some other way to show your undying devotion, something that doesn’t, say, damage historic structures and burden the city with maintenance costs. Something like, I dunno, a kiss in the Tuileries, or a pinky swear atop the Eiffel Tower. These are just ideas, folks; feel free to come up with your own. And please do it soon. To sum up, dear travelers from other lands, kindly unlock your love and lift the weight of it from the shoulders of the Parisians. Save Paris’s frail, old bridges. That’s a much more loving act, don’t you think? Update: I received a huge response to this post, which went wildly viral—over 3000 views from readers around the world. I had no idea others felt the same. 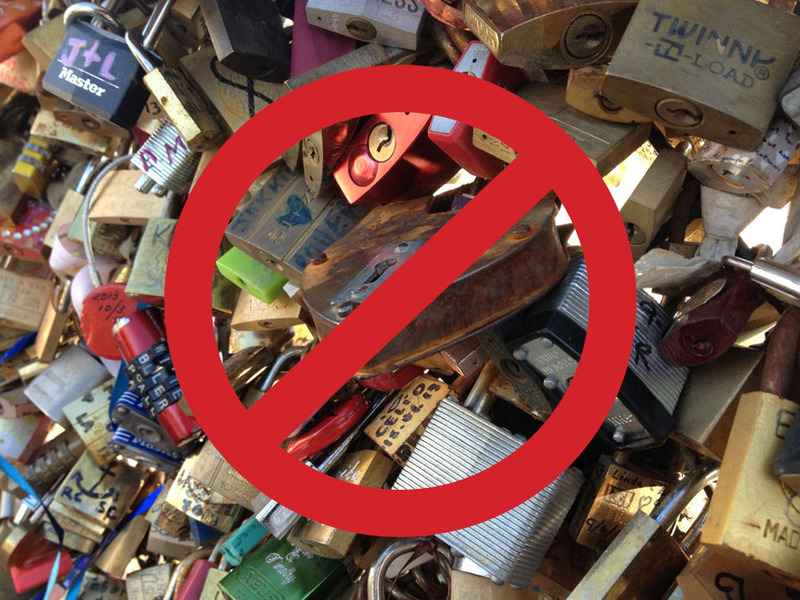 Inspired, I joined forces with blogger and friend, Lisa Taylor Huff, to create No Love Locks, a movement whose mission is to educate people to the destruction the trend is causing to historic structures, and to support efforts by the city to address the issue. Follow us on Facebook! I just read your post, and you’re right–we covered the same ground, from the 2010 vs. now timeline to Pont de l’Archevêché! Great minds…. It’s really destroying the look of these lovely bridges. I’ve also noticed the presence of the locks encourages other acts of vandalism, like graffiti. I’m afraid Paris (and other cities) are going to have to take a hard stance on this; the cost to maintain these bridges will become an encumbrance on the system. My suggestion: classify this as an act of vandalism and impose a fine on anyone caught doing this, then use that money to maintain the bridges (granted there is the challenge of getting the money from a tourist.) If not, here’s one thing they can do right now: remove all meshing from bridges and replace with a surface that makes it impossible to hang anything (glass would be lovely placed in front of the existing wrought iron, if it could be done affordably). If they can’t hang a lock, they won’t. Unless love stickers becomes the next craze. [Gasp!] This is a cause I’d like to take up. I’m not one to complain and do nothing. Love it, especially as anything remotely slushy makes me cringe! Ah, yes, slushy! I get it now. Mushy. Sappy. Or as we often say, pukey. i think everyone is misunderstanding what is going on here. what you see here is not the work of tourists, but rather a very bad case of BPV, the common papilloma virus that affects bridges. now now, don’t go casting aspersions that french bridges are ‘loser’ than bridges in other countries! it is quite simply that some bridges lack the proper immune response to fight off this often benign infection. a good dose of weekly maintenance could’ve prevented such an ugly accumulation of locks [the bridge equivalent of sores and warts], but alas, the French health care system is lacking in just this area. I like your post and agree. 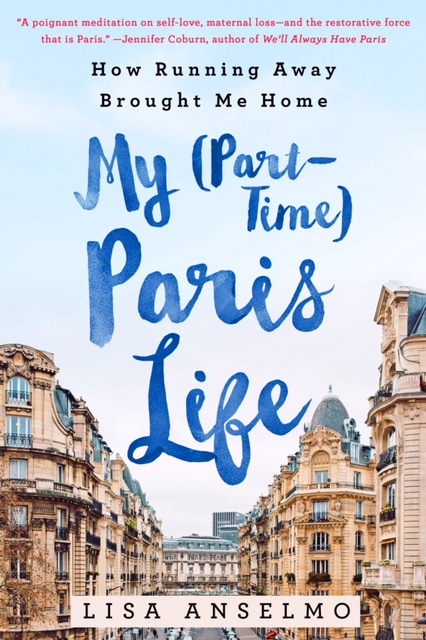 An American who has made Paris my main vacation destination, I’ve seen this novel, somewhat cute idea turn into an eyesore. The beauty of these bridges has been obliterated by this practice. No doubt the longevity of their structures as well. I like Lisa’s idea of classification as vandalism, not the removal of the mesh — that’s part of the beauty. The trick is to enable the ability to actually collect fines from violators. Lisa and I have been talking about this. We are fully obsessed now, and yes——the classification and removal of the mesh are both key steps to ridding us of this plague. Stay tuned for more posts from both of us on what you can do to help. Thank you so much Debbie in Toronto! I’m so glad you have enjoyed the read. Stay with me…more to come. Hope you’ll subscribe. My story will be featured on House Hunters International so stay tuned for details! On another note: do they have these stupid locks on Toronto? Lisa (Bold Soul) and I are now fully obsessed and fired up! She did an episode too and also has a great blog and another New Yorker…. Keep on living my fantasy life! I know the blog, but don’t yet know Lisa. I’ll have check into that! Thank you for subscribing and stay tuned.. I just thought of something else… instead of the harsh punitive measure I suggested (I can be a little tough sometimes), how about, when caught, they get hauled in, and offered a choice – go home or spend a day of performing community service? Aren’t I a softie? It may turn out to be the best, most useful day of their stay! HATE these locks!!! What about pre-2010 when there weren’t any??? I wish they would just take a hard line and get rid of them. They look gross and are hazardous…and everyone who threw a lock key in the river should pay a bloody fine towards the clean up!!!! I am so with you, Mrs Grumpy (great name, by the way). So many people hate them; it makes me wonder who likes them. Pont des Arts was such an elegant, ethereal bridge before the locks. Walking across it was like walking on air over the river. Now it’s like a bad punk rock nightmare. Hi Lisa… Just read your article and I’m in full accord! I am also a friend of Lisa T-H. I live in Antony, but every time I come up to Paris (I’ve been here almost 8 years now), I notice more and more how these pesky locks are just becoming a big eye-sore! And, when I read that they are potentially dangerous, I think that’s even more of a reason for the Mairie de Paris take action.. 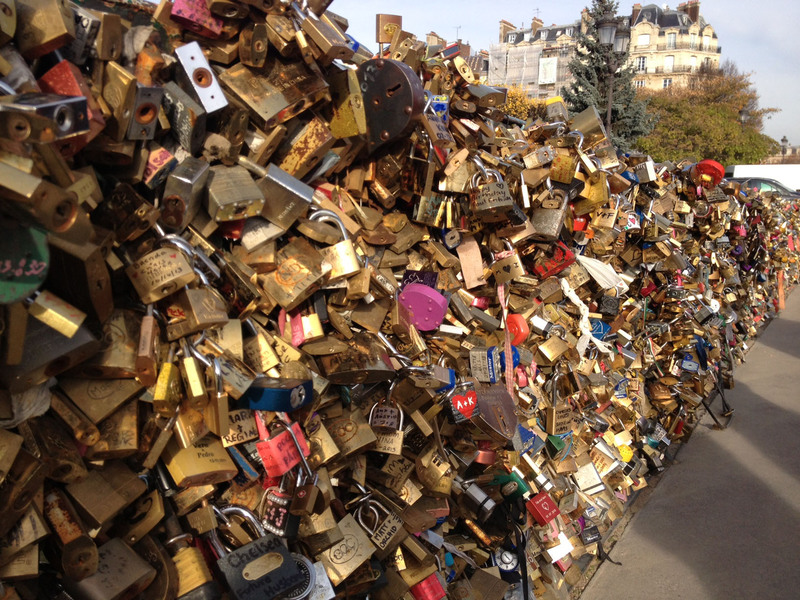 I think it may involve changing the bridge sides into stone (like on some of the other bridges on the Seine) to prevent people from locking their love locks! I hope they address the issue soon and deal with it.. Not that it really affects me in a personal way, and I ‘get it.’ But, we… who live here and call this city, home, have to see these things all the time, and the way it’s outta control has become a bit more annoying than the actual locks themselves.. Thanks for your support. Check us out on Facebook at No Love Locks. Lisa and I are on a roll! Oooh facebook group! I’m going to go check it out. I’m still grumpy about this LOL! Great! Join us! We’re building steam fast! Love Locks = Worst. Idea. Ever. And such an awful and unromantic symbol. Thanks for informing people and good luck to you Lisa Anselmo. Thank you! No Love Locks is really taking off. We are so happy to have such support from Parisians and world citizens alike! 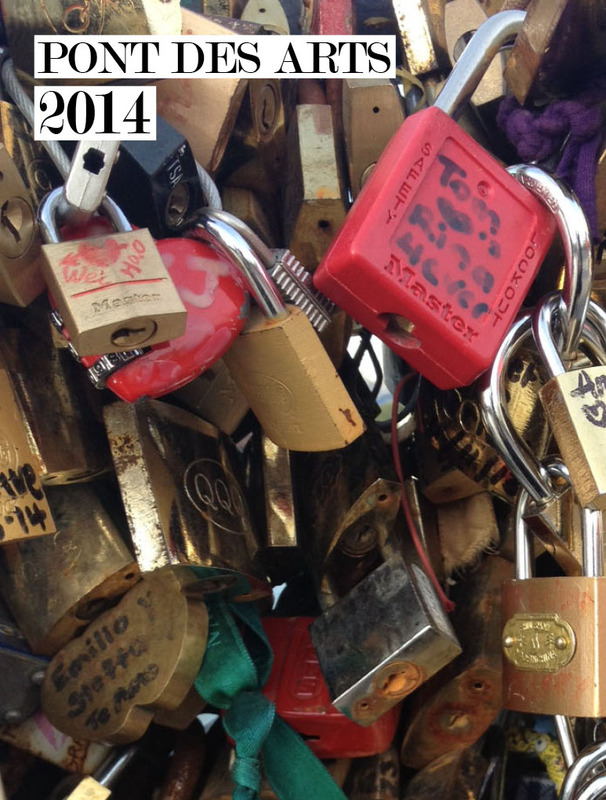 I pass everyday on the Pont des arts, the propagation of locks is just awful! That’s ugly and stupid (a lock, symbol of love?). I hate these locks.